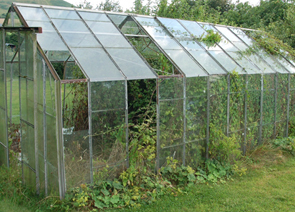 We’d inherited a splendid 18 foot old greenhouse, but like everything else it was ‘in need of repair’. About a third of the glass was broken, and a dense thicket of brambles had colonised every square inch inside, sprouting out in escape bids through the missing panes, and generally putting so much pressure on the remaining glass that the whole structure looked like a pressure cooker ready to explode. As with the refurbishment of the house, we heard some familiar comments from those who didn’t get the whole self-sufficiency thing about just knocking it down and buying a cheap new one. Of course Tom and Barbara wouldn’t have knocked it down! So standing side by side with Emma, secateurs in hand, we faced the impenetrable wall of thorns, determined to save our greenhouse before another summer’s growth smashed it forever. That first day we got barely five foot in. It was hot, dusty, hand to hand combat. A cross between Time Team and CSI, carefully unearthing long buried treasure. By day two our excavated treasure was forming the soon to be familiar pattern of useful rubbish and rubbish rubbish. After three days of blood, sweat and insects we had saved the greenhouse from the Triffids. Next we have to tackle the re-glazing! This entry was posted in Greenhouse and tagged CSI, Emma Alesworth, Good Life, Greenhouse, Paul Rainger, self-sufficiency, Time Team, Triffids by paulrainger. Bookmark the permalink. looking great guys, really interested to see how your year pans out. I am aiming for self sufficiency at my small inner city terrace, you can find me at http://www.selfandroots.wordpress.com !